Cosme de Net is an online shopping site for China and worldwide for skincare and cosmetics products. Their aim is to bring customers beauty merchandise at competitive prices without compromising quality. 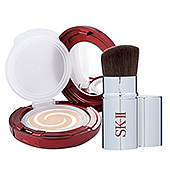 This innovative cream compact set provides radiant skin in one swipe while achieving full coverage. Includes “Enamel Radiant Cream Compact” and “Artisan Perfecting Brush”. “Enamel Radiant Cream Compact” features three-coloured swirls, each formulated using different extracts to enhance and care for the skin.